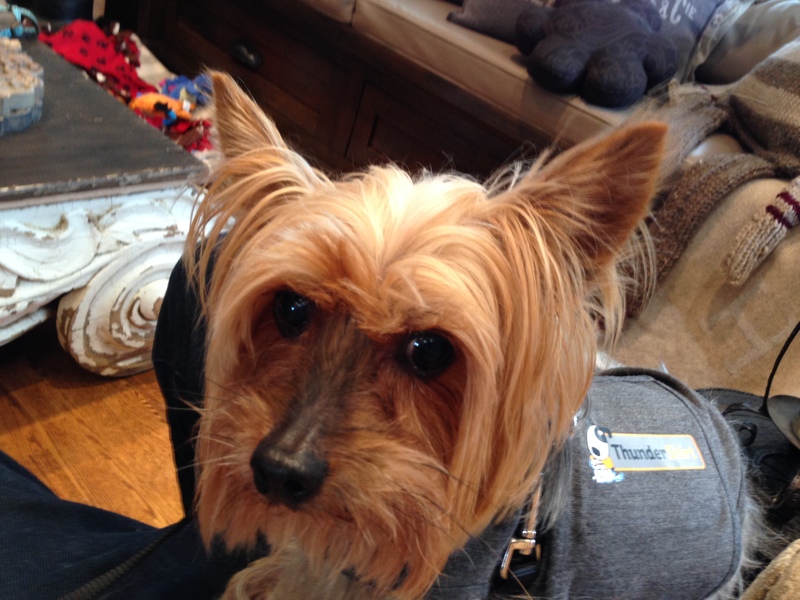 Trip is a seven-year-old Yorky who is currently being fostered by Little White Dog Rescue in Omaha. Trip was rescued from a really bad situation and due to his past experience, he is extraordinarily fearful of everything. When I first met Trip he was wandering around in 6 – 12 foot circles, literally pacing the porch and yard, over and over again. This is a sign of a dog in a serious psychological depression. Its a sort of coping mechanism but also signifies that the dog is caught in a sort of mental feedback loop. Anytime a dog is limited to walking around in circles, its a sign of a real psychological problem so I was extremely happy that I was contacted to help this little guy. Trip was outside on the back deck with a couple of other dogs when I arrived for the session. When Trip’s guardian took the other dogs into the house, I stepped outside so that I could observe and possibly interact with Trip. I walked out the door slowly and only moved forward when he was on the forward marching side of the circle he was pacing. I wanted to make sure that I was in the dogs line of sight when I moved so that I did not surprise him. I sat down on the ground and turned my back to the dog and remained completely still while I waited for Trip’s foster guardian to get back from putting the other dogs in the house. I wanted to present Trip with the least confrontational posture I could and hopefully entice him to come over and give me a sniff. At first Trip continued to circle as he had before, but after three laps I heard him approaching me from behind, a pause and then a return to his circling. It was brief, but my strategy had paid off. Even if it was only for a moment, I had peaked Trip’s interest engaged him to come over and this allowed the dog to pick up my scent. A proper dog introduction. Knowing that he was at least open to new stimuli, I tossed a high-value treat with a strong scent on the floor behind me. Trip continued to circle but after a few more laps, he did stop when he got to where the treat was and ate it. I offered him a half dozen additional treats the same way keeping myself facing away from the dog while remaining completely still. Once his foster guardian returned, I offered a few more treats. Some of these he took and some he did not. I was hoping to get him to come in closer for another sniff, but the initial brief sniff was all he was going for so I got up slowly and carefully shepherded him into the house. I had to take my time as the last thing I wanted to do was catch him by surprise or make him feel cornered. Once inside, I approached him slowly in a very soft manner and body posture, then attached a leash. I waited again before sitting down then standing on the leash a foot away from the dog’s head. All I wanted to do was prevent Trip from moving away from me. I made no effort to engage or touch him as my only goal was to get him used to my scent and presence. After discussing Trip with his foster guardian, I learned that he really only went to two places in the house and spent the rest of his time circling. To help break this cycle, I attached a Martingale collar and added my special twist of the leash. After leashing him up, I waited a moment to be sure he was relaxed, then I slowly led Trip to the door. Trip did not want to go and resisted by pulling against the leash or trying to sit down. To make sure it was not a traumatic situation, I used several short gentle pulls of the leash to get the dog moving forward. Forward may be the wrong description here as Trip was moving to the right and left behind me, almost in a S-type pattern. I asked his guardian to remain at the house so that I could walk the dog by myself to evaluate him alone. Often times, humans can influence a dog unintentionally and I wanted to make sure that I got an independent read on the dog. This is frequently the case with foster parents of dogs who feel sorry for what happened in the dogs past and try to make up for it by over loving the dog and forgoing any rules or structure. While Trip’s foster had clearly done a great job of getting him out of his shell, it was time for him to start moving forward. Once we got outside, Trip tried to shut down again but I continued using the same technique I did inside the house and eventually my technique got him walking forward again. Trip stayed behind me as we walked away from his foster home, occasionally turning and looking back. I continued to move forward, gently pulling on the leash until he would start walking again then letting all the tension off the leash. I let the dog go wherever he wanted, which was behind me, moving from right to left in a zigzag motion. I wasn’t so concerned where he was going so much as the fact that he was moving forward. When Trip was pacing these laps / large overlapping circles, his brain was essentially locked into the same loop. The best thing to do for a dog at this stage is get it outside of its own head which is why the walk was such a great exercise. 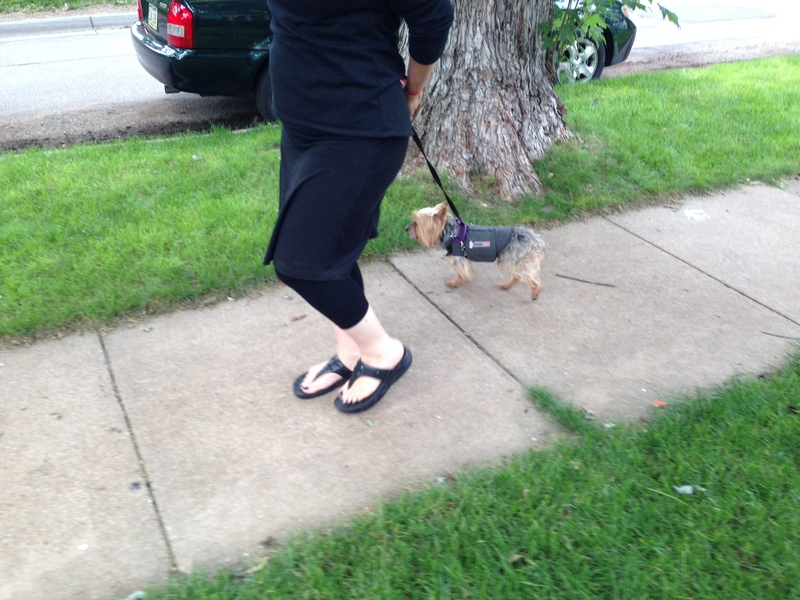 After walking back-and-forth in front of the house a few times, Trip was starting to walk more forward and less to the sides so I invited his foster guardian to join me and we started out for a walk around the block. At first Trip went back to walking behind his foster guardian resuming his side to side movement. His foster guardian did a great job of keeping the leash loose and passing it from her right to left hand behind her so that he could go where he pleased while we continued walking forward. As the walk progressed I could see gradual signs of improvement from Trip. He started to carry his head higher, his ears came forward, he started to walk at a quicker pace, occasionally even pulling in front of his handler. As we continued, so did the increase in Trip’s confidence. 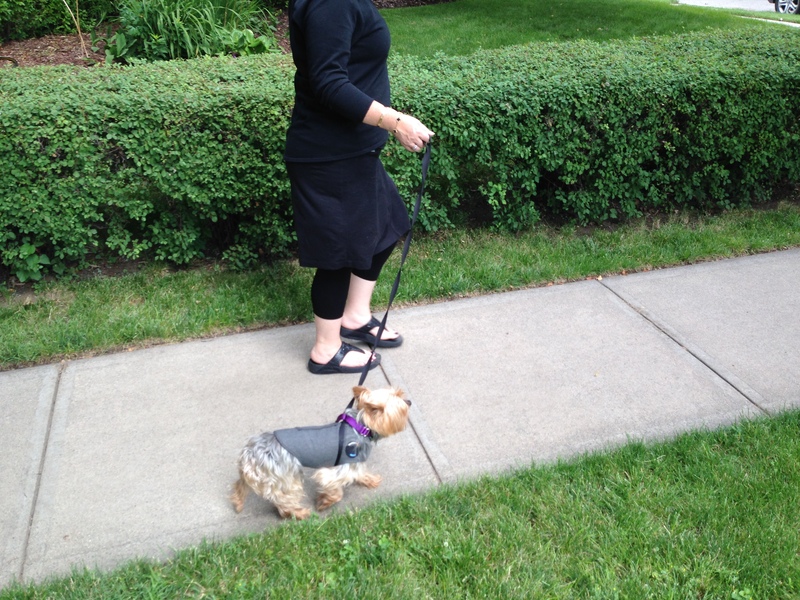 By the time we got to the back side of the block, the dog was walking mostly at a heel beside his foster. One of the signs I was looking for started to happen in short bursts. Usually when a dog feels really good about itself it has a bounce in its step, almost a trot like movement when they are walking forward. I started to see little glimpses of this from Trip as he walked beside his handler and stopped darting from side to side. Along the way we passed a house with a few dogs in the back yard behind a fence. I saw this before we got to their house and gave Trip’s handler some tips on how to handle the situation. She did a great job of leading Trip, walking by the dogs without pausing. Because she didn’t react to them and was walking with a very confident, but casual manner, Trip hardly reacted to these dog’s barking. He attempted to stop for a second, but she gently corrected him and was able to keep Trip moving forward. This was a huge step. When we returned to Trip’s foster home his foster guardian commented on how he was already acting differently. Instead of returning to his old ways of retreating to one of the same two areas in the house, he stayed next to us even though we were no longer holding the leash. I finished up the session by going over a strategy to help Trip gradually increase his exposure to the outside world through walks. This experience should lead to increased confidence for Trip. We don’t want to move too far too fast. Trip is coming from an almost non functional place so patience is the order of the day. Because he was so troubled, I really have to take my hat off to his foster guardian. She said when they first got him he was completely shut down; sitting in a corner shivering and not interact8ing with anything aside form cowering. Her patience and tenderness has no doubt helped the dog learn to start to come back. Instead of sitting and cowering in fear, he was moving forward, albeit in circles. Now that we were able to get Trip outside the house walking under his own power, the experience will lead to an increase in self confidence. Again it’s going to take small steps and careful observation, but based on his improvement I’m very optimistic that Trip is on the road to learning how to be a dog again.